Effective spray adhesive for large area coverage suitable for heat sensitive substrates. 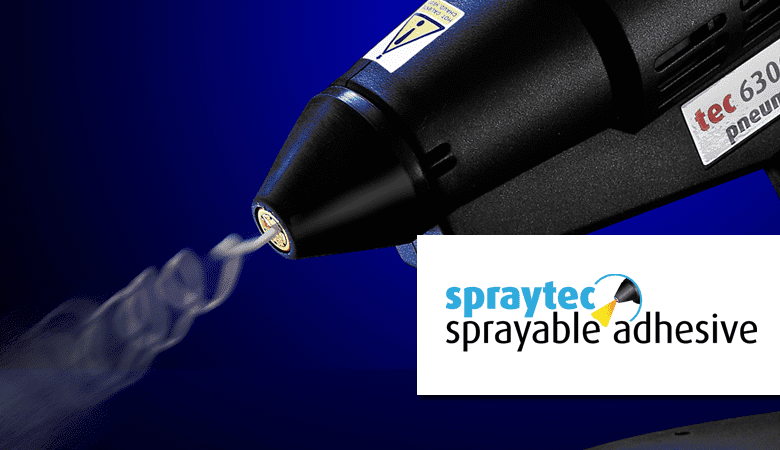 Spraytec hot melt spray application has revolutionised the use of hot melt adhesive on temperature-sensitive materials, such as plastic foams and films. Spray application provides a wider area of adhesion, improving bond strength on weaker substrates when compared with bead application. Thermal damage to temperature-sensitive materials is prevented, as the specially formulated adhesive quickly cools when sprayed, but still retains its surface tack. An additional benefit when using spraytec adhesive is that there is no waste. Any unused adhesive left in the tool at the end of the job simply re-melts when the tool is next switched on and can continue to be used in the normal way. Unlike solvent and water-based spray adhesives, spraytec has an indefinite shelf life and does not require any special packaging, transportation, or storage. Spraytec is safe and easy to use, it does not require masks or other protective clothing as the adhesive goes only where it is required. Our unique spraytec adhesives are completely solvent and water free.